“The mind is like a parachute: it doesn’t work if it’s not open.” Frank Zappa probably didn’t have alternative spirituality in mind when he said these words, but they pertain to the subject nonetheless. We exist in a time and place where the boundaries of the realm of spirituality have been expanded, making space for a wide array of approaches and practices. Spirituality in general is a highly personal, sometimes controversial subject — alternative spiritual practices are no different. Responses to these practices are wide-ranging. Naturally diverse perspectives on the subject are the product of multiple influences, perceptions, and sources of information. The realm of alterative spirituality and its practices can prompt intrigue, skepticism, or something in between — but the most important part of approaching the subject is having an open mind, and perhaps a functioning parachute. Notoriously challenging to define, alternative spirituality is often referred to as “post-traditional spirituality” or “New Age spirituality.” This indicates its push toward deeper and more referential understanding. Where these monikers do not suffice, alternative spirituality is generally understood as spiritual practices concerned with self-development, healing, and personal transformation. The idea as a whole is quite difficult to define. In addition to the concepts, the diversity represented within the wide spectrum of alternatively spiritual practice, can present a challenge for individuals looking to become engaged or those who are simply curious. In many ways, the intention is to avoid classification and narrow definitions that cannot aptly express the diversity of alternative spirituality. This fluidity of definition, in some senses, pays a sort of homage to one of its main principles: “transformation” or “becoming”. For those who practice, transformation is then elevated into the company of other notions, which similarly evade definition and can include love, truth, beauty, art, and god. With so little in the way of a comprehensive definition, the exploration of alternative spiritual practices can seem daunting and unfocused. The cultural diversity enjoyed in Toronto — Canada’s largest and most diverse city — lends itself to an impressive range of practitioners and practices. Strolling down a Toronto street, the signs in windows invite passersby to engage in a multiplicity of choices. There are the more well-known culprits, such as massage therapy, acupuncture, and yoga. Accompanying these familiar faces are relatively unknown characters; strange words and phrases like “Reiki” and “mindfulness meditation”. Although represented well enough in the Toronto community, these practices are relatively unfamiliar and esoteric. Whether you’re navigating these storefronts of Toronto streets or simply looking to familiarize yourself with some of the basics of these practices, an understanding of the lengthy history and origins of alternative spirituality is helpful. Reiki is a Japanese healing technique which operates on the assumption that “life force energy” channels through us and constitutes our being. The word Reiki is comprised of two Japanese words, Rei and Ki, which translate as “spiritual energy” or “universal life energy.” It is a technique for relaxation and stress reduction, which also promotes healing. Nearly a century old, Reiki is rooted in the Eastern metaphysics of energy and vibration. Expanding beyond its Eastern roots, Reiki has been growing in popularity and commonality, particularly in diverse cities like Toronto. Frans Stiene, a senior Reiki teacher at the International House of Reiki, stresses that the practice is heavily rooted in mindfulness. “The system of Reiki is all about mindfulness as all the practices are meditations,” he says. Stiene elaborates, “When we become more mindful we get less distracted by the past, present, and future which in turn will help us to stay more focused.” He adds that by creating focused awareness individuals can reduce stress. The practice itself, at the most elementary level, can be described as the “laying on” of hands, with the intention of realigning and restoring spiritual and energetic balance. “It’s a very difficult thing to describe,” says Alice,* a Reiki Level Two student who has experienced various forms of energy work. “It’s a very calming experience,” she says, adding, “to me — the best way I can describe it — it’s this feeling of a soothing, gentle energy.” She is careful to add, however, that it is a very individual experience and others may have a different impression. Crystals, healing stones, and semi-precious gemstones are often used as an adjunct to energy-healing Reiki sessions, or even on their own. Historical records of crystal healing dates as far back as the ancient Sumerians and are established for their personal utility in various belief systems. The ancient Greeks, for instance, carved goblets out of amethyst stone with the intention of preventing drunkenness. The theory of chakras is dynamic and detailed. The Sparknotes version would likely state that there are seven main loci of energetic power in the human body which, when a person is healthy, are in alignment, balance, and are free of blockage. For believers of crystal healing, it is understood that the rates of energy vibrations in a crystal, when matched with the appropriate chakras, will assist in healing and a return to a normal, harmonized state. Walking into one of two Gifts From the Earth locations in Toronto, a shop that specializes in crystals from a geological and spiritual perspective is daunting. 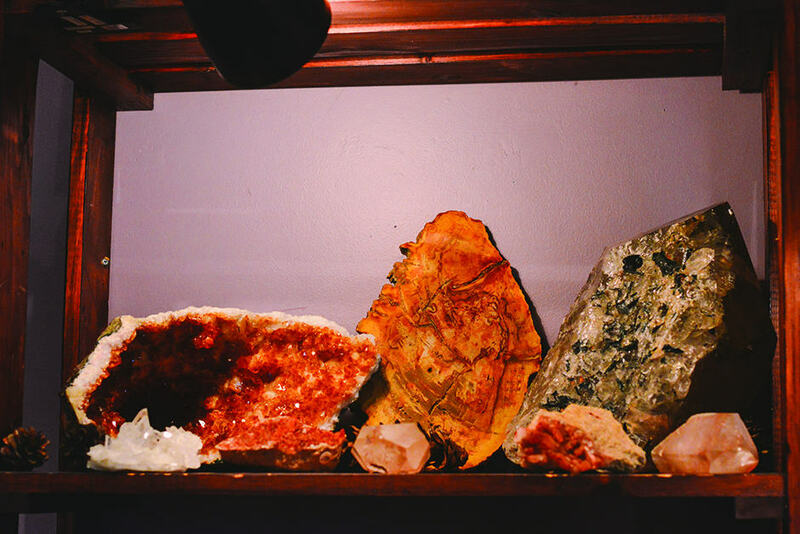 The Danforth location is filled with an almost astounding array of crystals, ranging from small, pocket sized objects to three foot tall specimens of raw amethyst — the latter of which can’t help but impress. With this enormous selection, choosing one seems like an impossible task. According to expert recommendations, however, the answer is simple — pick the one that draws you in. This advice is offered on the basis that an energetic attraction will guide you to the crystal that you most need. Historically, crystal healing has had links to Western medicine as well; the idea of colour as a healing quality in crystals was reinforced by colour therapy equipment present in Western hospital rooms until the middle of the twentieth century. Crystals are sold in a variety of stores around the city. One such establishment is Wonderworks, located on Baldwin Street. 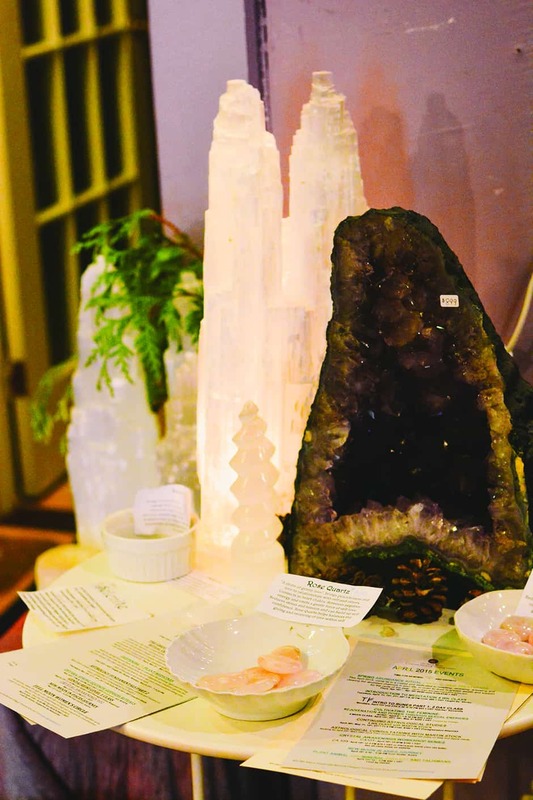 Natalie Krolikowski, one of the stores employees, describes the business as a “natural healing store.” Wonderworks offers a wide selection of crystals, floral essences, and more adventurous items including magic candles. 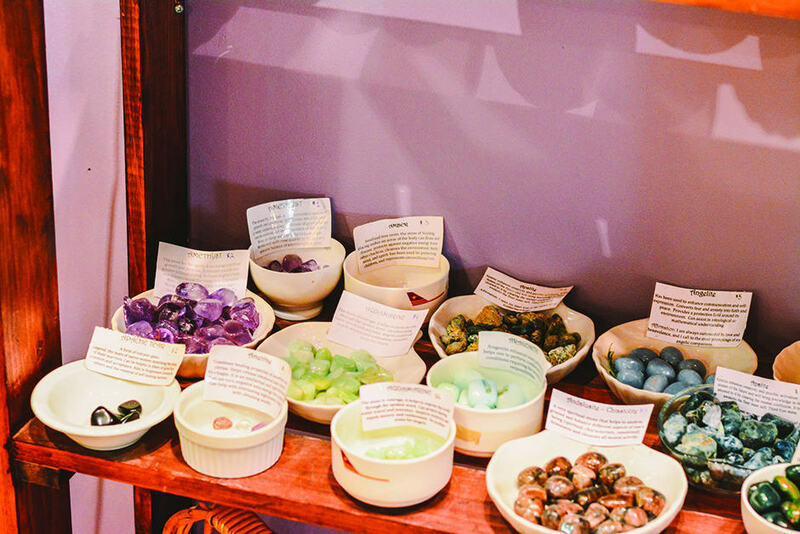 “We section off our crystals according to your needs, for example, mental focus,” Krolikowski says when asked specifically about navigating the store’s crystal selection. Wonderworks is an intriguing shop. To the untrained eye, the stock of the store appears as organized chaos. The merchandise is neatly organized, but it’s unfamiliarity to some may make it feel a little overwhelming. 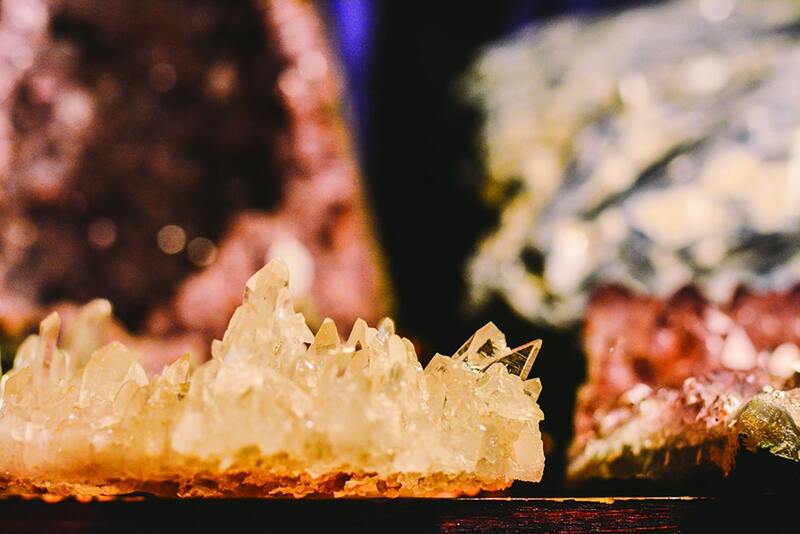 Rochelle Holt, owner of Wonderworks, offers some advice to beginners exploring the practice of crystal energy that extends to alternative spirituality in general. “Try not to be too overwhelmed and listen to your intuition,” says Holt. Though practices like Reiki and crystal healing may seem unapproachable to some, Wonderworks merchandise also includes products that may have a more general appeal. 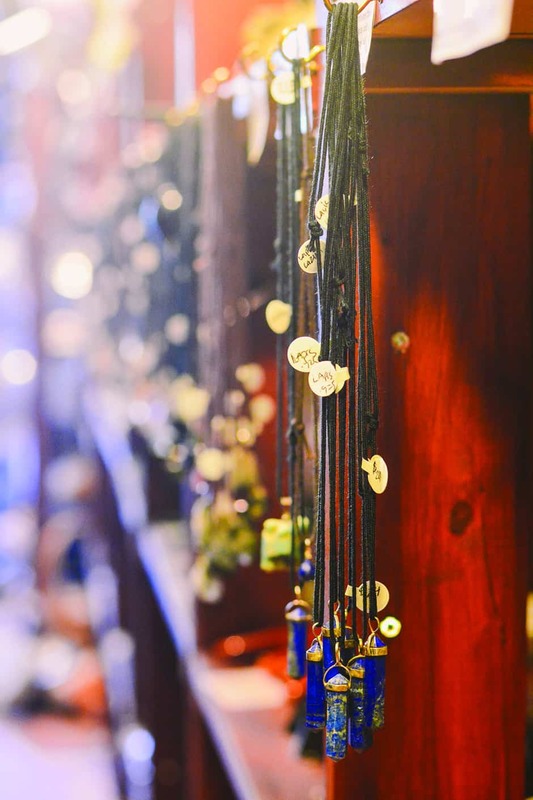 The store carries a selection of candles, as well as a wide range of aromatherapy merchandise, including incense, essential oils, and bath salts. These products have a distinct tie to alternative health and spiritual practices, but may also be enjoyable to anyone looking for some relaxation. Meditation is practiced by many cultures and within various spiritual and religious beliefs around the world ­— evidenced by 3,000 year-old Indian scriptures. Understood as simply being, meditation is about letting oneself fully resonate with life, in a way that qualifies neither suffering nor joy. Tibetan Buddhist Chogyam Trungpa Rinpoche says, “Meditation is based on three fundamental factors: first, not centralizing inward; second, not having any longing to become higher; and third, becoming completely identified with here and now.” In other words, meditation introduces you to true selfhood, despite the impostures and impositions of the world. It puts you in tune with your mind and body, it works to subdue the ego, and it allows you to face everything without judgement. The effects of meditation are mental, emotional, physiological, and spiritual. Its practice effectively reduces mental and physical stress, improving emotional intelligence. Meditation brings tranquility and healing, and even improves neuroplasticity. Zach Summerhayes, a student at the U of T, says that his ongoing experience with mindfulness, aids him in being fully present and acquiescing in feelings, thoughts, sensations, and the moments of life. “It has opened up the possibility of experience in everything, provided me with the tools to know myself better, helped regulate my emotions and discouraged the projection of my automatic beliefs, so that I can engage with experiences more in the moment,” says Summerhayes. Whether you are already committed to a practice or have yet to find a suitable option, it is important to try various practices out in the hopes of getting the most enriched, enlightening, and safe experience. Finding the right modality is often a matter of deep feeling and intuition. If something is stirred within you, chances are, you are on the right path. Cataloguing these sensations is in keeping with the notion that the value of alternative spirituality is a matter of cumulative experience, rather than stated ideology or doctrine, and primarily depends on the persons involved. There is a growing trend in alternative spirituality, but despite an increased presence in mainstream society, navigating the legitimacy of resources remains something of a challenge. That being said, accurately informed guides do exist. Toronto is full of authentic retailers providing a plethora of materials from sage smudge sticks and crystals to therapeutic essential oils, incense, and reading materials. A few of these retailers include Wonderworks, The Rock Store, Gifts from the Earth, and House of Energy — all of which offer many opportunities to expand and explore conceptions of spirituality, for the curious mind or complete skeptic. Alternative spirituality remains a fascinating avenue of enquiry clawing back to the lively discourses of philosophy and metaphysics on the subject of spirit. So who could then reasonably expect a clear answer on the benefits of alternative spiritualism? Perhaps the only answer available is first-hand experience. *Name changed at person’s request.